Beyond The News We Can Find Solace In The Night Sky, Stars And Universe : 13.7: Cosmos And Culture The great irony of modern life is that we know more about the universe than those past, but few of us have direct contact with the emotional magnitude of the night sky, says astrophysicist Adam Frank. This detailed view of the star formation region Messier 78, in the constellation of Orion (The Hunter), was taken with the VISTA infrared survey telescope at ESO's Paranal Observatory in Chile. 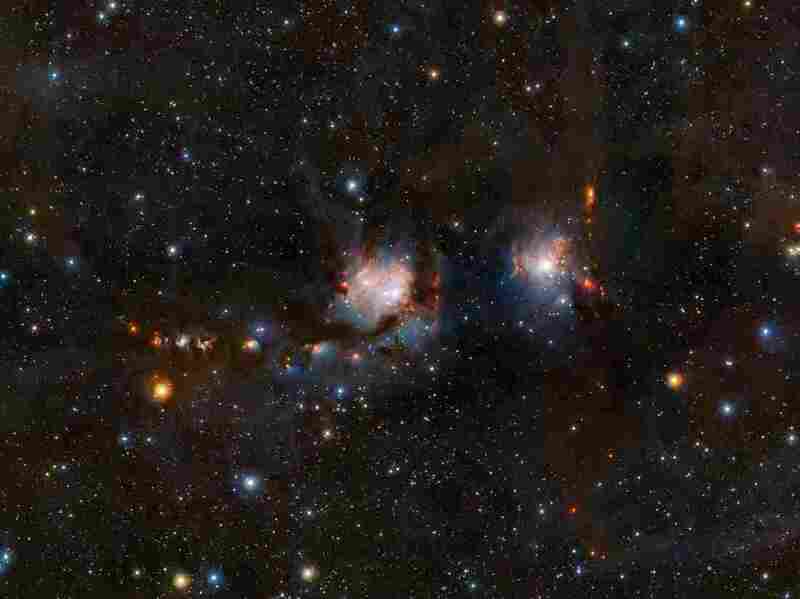 As well as the blue regions of reflected light from hot young stars, the image also shows streams of dark dust and the red jets emerging from stars in the process of formation. When I was a kid, I looked to the stars for solace. No matter what was hard or painful or seemed inescapable in my life, I only needed to go out in my backyard at night and tilt my head back. I lived in the congestion of North Jersey, a few miles from Manhattan. That meant my skies were never dark. It didn't matter, though, the few stars I could see where enough. They reminded me of a truth I really needed back then. It was if the stars were saying: "Everything in your world is no more than a soap bubble. There is much, much more. We're here to remind you of that." Over the last few days, the news has focused on things that come to light, truths not generally known suddenly revealed. I had the good fortune to be watching the nation's roller coaster ride unfold from a cabin up in the north woods where I'd retreated to work on my book. As the thin sliver of an Internet connection kept me linked to the unfolding drama, I had time to think a lot about what is true and what is hidden. But then, remarkably, every night I'd see what's hidden to most of us — and I remembered those experiences I'd had as a kid. Miles away from cities and the "noise" of their light, I could see the stars — all of them visible to the naked eye. And, once again, I was reminded of their strange message of freedom. The great irony of modern life is that while we know more about the universe than any of the 2,000 generations preceding us, most of us have no direct contact with the full emotional magnitude of the night sky. If we are lucky, we can get to a park or somewhere in the suburbs where a fraction of the usual light pollution is blocked. But the true glory of a true dark night — that's something most of us only get a few times across our lives. But the meaning of a dark night can't be hurried. You can't step out for a few minutes in your slippers, wrapped in a blanket and hear what the stars are telling you. No, you have to prepare. You have to give it time. And you have to be dressed for the quiet effort. It will take long enough just for your eyes to adjust so that you can see the all stars between the stars. Then you have to settle down in a chair or in a sleeping bag. You'll need wait for the boredom to rise and then pass again. Only when your monkey mind has worn itself down a little will the real change come. That's when the stars become 3-D. That's when they stop being pasted on a bowl overhead and you realized they are underneath you, too. And that's moment their message of expanse and endless possibilities beyond just today's news can reach you. That is when the stars can whisper to you: "Everything in your world is no more than a soap bubble. There is more, much more. We are here to remind you of that." While I can't directly show you what I saw those nights, I can (again) share this amazing time-lapse video of the night sky over the mountains. Of course we have to be engaged with the larger worlds of business and politics and the day-to-day realities of getting kids to school and ourselves to work. That world will always have its share of great sorrow and fear. But we can also remember what has been hidden right over our heads. We can also find the time to try and reconnect with that truth — even if it's with the few stars we can see from our backyards or our rooftops. It just takes a little time (say a half hour) and little effort (a blanket, a chair, some warm clothes). Carl Sagan was right about us being star stuff. But what he said will only be a bunch of words if we don't take the time to look — to really look — up at what is always waiting to be revealed.